A movie review of “Mad Max: Fury Road”: Sheer pyrotechnic insanity. 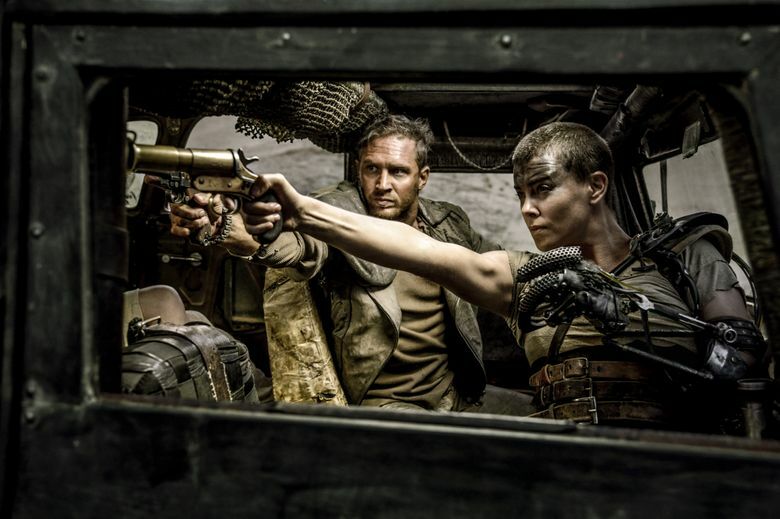 Director George Miller proves he still has it with this fourth installment of the series starring Tom Hardy and Charlize Theron. Rating: 4 stars out of 4. We’re talking “Mad Max: Fury Road” here. It’s been 30 years since the last “Max,” the regrettable and forgettable “Mad Max Beyond Thunderdome” — Lost children? Tina Turner? Lame. But really, it’s been 34 years since the franchise’s previous peak, “The Road Warrior.” With “Fury Road,” George Miller, who directed all four of the “Maxes” and co-wrote this one with Brendan McCarthy and Nico Lathouris, proves beyond a shadow of a doubt that after all this time he still has it. “It,” meaning an all-consuming addiction to demento-extremo stunts and high-octane vehicular mayhem. ‘Mad Max: Fury Road,’ with Tom Hardy, Charlize Theron, Nicholas Hoult, Hugh Keays-Byrne. Directed by George Miller, from a screenplay by Miller, Brendan McCarthy and Nico Lathouris. 120 minutes. Rated R for intense sequences of violence throughout and for disturbing images. Several theaters. Miller’s style is over-the-top all-of-the-time. Across a hellish landscape of rust-hued desert sands and towering, lightning-lit sandstorms, in the first of many jaw-dropping chases, Miller sends squadrons of bald berserkers driving all manner of much-modified, big-wheeled, scuffed-up retro hot rods in hot pursuit of a fleeing Max (Tom Hardy, taking over the part from Mel Gibson, who originated the role). Also on the run in a monster truck from these raging crazies is a shaven-headed, one-armed fearsome female road warrior with the fabulous moniker Imperator Furiosa (Charlize Theron, grim-faced with kohl-rimmed eyes). These pursuers are accompanied by a ride-along band of pounding war drummers and a crimson-clad guitarist whose electric ax shoots flames out the neck. Nothing subtle here. “My name is Max,” Hardy growls. “My world is fire and blood.” Believe him. Civilization has collapsed, and the ruins are ruled by a disfigured dictator named the Immortan Joe (Hugh Keays-Byrne, who played the villainous Toecutter in the original 1979 “Max Max”). Captured, chained and slowly drained of blood to fuel the Immortan’s unnaturally white and diseased young male minions called War Boys (the main one of whom is played by Nicholas Hoult), Max has plenty of reasons to be mad. The long-ago violent deaths of his family, which haunt him in flashbacks, make him even madder. So when he finally escapes and emerges, like some primordial creature out of the desert dust, his goal is vengeance, which to him will be his only redemption. He joins forces with Furiosa, who is seeking redemption as well by rescuing and fleeing with the five young slave wives of the Immortan. Who look like swimsuit models wrapped in diaphanous white garments. These lovelies provide a weird contrast to all the grime and grease, but they’re part and parcel of the bizarro extremity of Miller’s vision and somehow they fit in with everything else. “Fury’s” pace is delirious, the stunts are incredible — such crashes, such explosions, such a lot of flying bodies — Hardy’s performance is a marvel of subdued conviction and Theron brings an impressive gravity to her work as Furiosa. Put it all together, and you’ve got a rousing crowd-pleaser that hits on all fast-revving cylinders.